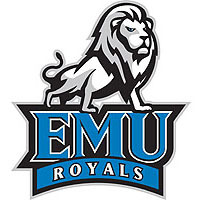 The EMU basketball women used a balanced attack to roll over visiting Mary Baldwin University Friday afternoon in Harrisonburg, 87-33. Eastern Mennonite grabbed 31 offensive rebounds and never trailed in improving to 5-4. The women have one more non-conference game on Monday, hosting Frostburg State in another afternoon game, tipping off at 3:00pm. They play at Hollins next Wednesday and finish the year with 14 ODAC games. Myneshia Walker (Freeman, Va./Brunswick) grabbed the opening tip and quickly went to the hoop for two, and Jonae Guest(Dumfries, Va./Potomac) converted an offensive putback on the next possession, setting the tone for the game. The Fighting Squirrels (1-8) tied the score at 7-7 midway through the first before the Royals took off. Walker canned a triple to start a 15-0 run, scoring 11 of the points including a trio of threes, as the Royals jumped ahead 22-7. They went inside in the second period, at one point scoring 10 straight on layups, pushing the margin to 51-20 at halftime. The starting five opened the third with a 14-2 run before taking a permanent seat. Tierra Cochraham (Alexandria, Va./Thomas A. Edison) added some excitement by swishing a shot from half court at the end of the period, making the score 72-30. The reserves then held Mary Baldwin without a field goal for the entire fourth, allowing just three points on free throws. Eastern Mennonite limited the Fighting Squirrels to just 3-for-25 shooting after halftime and finished with a shooting advantage at 45.8% to 22.9%. The women racked up 17 steals to force MBU into 26 turnovers with a +12 margin. The Royals also crashed the offensive boards, earning one more rebound under their own hoop than on the defensive end, and dominated the overall battle, 61-22. Walker showed no rust from the 11-day layoff since the last game on Dec. 19. The junior shot 9-13 from the floor and broke her career high with 21 points in just 19 minutes. She grabbed six offensive rebounds, and set a new high with nine overall. Washington notched a double double with 11 points and 11 rebounds. Chloe Roach (Leesburg, Va./Tuscarora) got her hands on eight steals and co-led the team with five assists. Precious Waddy (Richmond, Va./Henrico) also had five helpers. Brianna Zook (Harrisonburg, Va./Broadway) set a career high with 12 points. Jourdyn Friend (Richmond, Va./Meadowbrook) grabbed six offensive rebounds and totaled 11 for her third straight game in figures. Anna Ramirez led Mary Baldwin with 10 points. Nicole Blackburn added seven rebounds and six points.